Want to spend your holidays in the sun whilst surfing, to completely disconnect from your daily life? Sandycamps is the ideal place! Sandycamps offers authentic stays, in a small fishermen’s village called Imsouane, the best surf destination of Morocco. Whether you are a beginner or intermediate, Sandycamps offers you packages that will suit your needs, to make sure you spend a memorable stay, full of encounters and discoveries. Sandycamps knows how important a good accommodation is to make your stay unforgettable. With this goal, everything at Sandycamps has been thought for you to spend comfortable, relaxing, and enjoyable holidays. Sandycamps are settled in a peaceful hostel of Imsouane, in a lush oasis where birds are plenty, surrounded by the mountains and the ocean. You’re invited to fully enjoy the beautiful inside garden, pool, hammam and the bar-restaurant. The rooms and collective spaces are comfortable and cozy, decorated in a style that combines Moroccan tradition and modernity, making you feel instantly at home. You will have the opportunity to relax by the pool after a surf or yoga session, recharge batteries at the hammam, as well as sunbathe on one of our sunny terraces. There will be an additionnal charge of 20 EUR per day, a total of 140 EUR a week, to privatize the room for a single person. Sandycamps offers holidays in the sun, surfing or practicing yoga, to completely disconnect from your daily life. Open to all levels, and budgets, it is the perfect starting point to discover the fisherman's harbor, facing the notorious bay where breaks the longest wave of Morocco. Sunbathe next to your pool or on a terrace, enjoy a traditional hammam, taste the delicious tajines cooked by the chef, and end your day with a mint tea watching the sunset. Your stay is constructed according to weather conditions (swell, wind, etc) to adapt surf sessions to the best conditions and the most favorable times of the day. The time of the activities, their content and the resting day can vary. Beginning of your stay: Your package begins on the day of your arrival with a lively dinner with all the Sandycamps team. The check-in starts at 4 p.m. We're happy to welcome you in the room sooner if available. If you should arrive on your own, please note we are closed after 9 p.m. (let us know if you'd like to arrive later). During your stay, apart from your arrival and departure days, your package includes 3 meals a day. You attend the activities planned in your package (2 x 2 hours of surf sessions per day in the Surfaddict, 10 x 1 hour of yoga lessons per day in the Yogaddict and full access to all surf (4 hours per day) and yoga lessons (3 hours per day) in the Sandypack). Wednesdays are resting days (may vary according to surf forecast), you can choose to rest by the pool, rent a board to enjoy more surfing or join our weekly day trip to visit the city of Essaouira whose medina is a world heritage site registered in the UNESCO. End of your stay: On your departure day, breakfast is included, marking the end of your package. Check-out from the rooms is at 11 a.m.
You are welcome to join our classes on your arrival and departure days for an extra 10 EUR per yoga class (1 hour) and 25 EUR per surf lesson (equipment included). Sandycamps is nestled in an oasis of greenery between mountains and ocean. Discover authentic stays, in a small fishermen’s village called Imsouane, the best surf destination of Morocco. 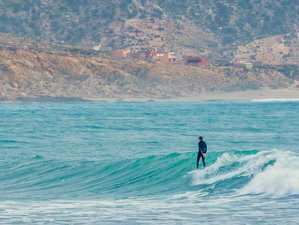 Just a few hours from Europe, between Essaouira and Agadir, away from crowded tour operators and trendy surf spots, Imsouane is a surfer’s haven. This preserved area will offer you an original and relaxing experience of an intact Morocco. With an all-year long summer atmosphere and the feeling, you're at the end of the world, there's no such place as Imsouane to unwind and recharge your batteries. Practice yoga in ideal conditions, on long sandy beaches, on rooftop terraces or in the 100 square meters yoga shala. Imsouane offers surf spots adapted to all levels. Its exposure is unique, you can surf with any swell size and direction. With 4 different surf spots, of which the amazing wave of the bay breaking on more than 500 meters and its wild scenery, Imsouane is the ultimate surf destination. No matter your surfing experience, you’ll always find an amazing wave here. Sandycamps is in the quiet fishing village of Imsouane, 80 kilometers north of Agadir and 85 kilometers south of Essaouira. Sandycamps is only two or three hours for most of the European airports. It is the ideal surf destination all-year-long for a total change of scenery, 300 days of sunshine per year, and perfect waves. Every morning, treat yourself to delicious and healthy breakfast made of fruits, fresh bread, jam, honey, cheese, a glass of orange juice, warm milk, coffee, and tea. Served on your sunny rooftop terrace or in our restaurant, it will fill you up with the best energy to start the day. Lunches are generally taken at the camp. After an appetizer made of a fresh vegetable salad, Sandycamps will delight you with delicious national dishes (vegetarian options upon request) like chicken, beef or fish tajines with vegetables or traditional couscous. The chef will cook you a feast every evening to make sure you finish the day in the best conditions with a large choice of local and international dishes. For dessert, you will have a selection of Moroccan pastries, cakes, yogurts or fresh seasonal fruits, with the sound of the waves as background or the live music of our hostel performing several evenings per week. Want to do more than just practice surf and yoga? Sandycamps offers many other activities! Imsouane is blessed with a wonderful nature, climate, and wildlife. Benefit not only from this amazing location but also from our thoughtfully selected equipment. Here are some of the extra activities you can do at Sandycamps: play beach games, have fun at our outside pool, relax in our hammam, get a nice massage, go hiking, fishing, join our camp fire and barbecue night, listen to the live music several nights a week, enjoy a beer around a pool table. It is one of the most beautiful Atlantic coastal towns, built on a peninsula swept by trade winds. Essaouira is authentic and bewitching. Centuries of colonization have shaped its architecture, unveiling Portuguese, Berber and French influences that grant an unmatched character to this city once called Mogador. Wander in the street labyrinth of its Medina, listed as UNESCO World Heritage, and discover a world of artists, art galleries, riads, and many craft shops surrounded by fortifications. Essaouira is famous for its laid back atmosphere and long, sandy beach but also contrasts with large parts of the city dating back to the 16th century. A total change of scenery. On the way to Essaouira, you will have the opportunity to stop at a cooperative, founded and managed by Berber women of this region, a region famous in all Morocco for its argan products. This is a love-at-first-sight destination! A shady road, bounded by olive, almond, and palm trees lead to this breathtaking oasis where waterfalls arise from the confluence of mountains and streams. This special environment gave birth to a lush vegetation and natural pools. Welcome to “Paradise Valley”, once the hideout of Aquarelle painters and hippies in the 70s. You are invited to discover a surprising place of pristine water blessed with an exceptional climate all year long. Nearby is the small village of Imouzzer on the edge of a valley, offering a magnificent landscape and color range with its palm grove and flat white roofs. The main activity of the village is beekeeping and its inhabitants produce a popular honey of flowers, lavender, thyme or even cactus flavor. A souk takes place every Thursday turning the small village into a dynamic place where many local products are sold. An exotic experience! Sandycamps befindet sich im marokkanischen Imsouane. Das Team bietet All-inclusive-Urlaub am Strand mit Surf- und Yogapaketen, bei denen Sie sich entspannen und abschalten können.